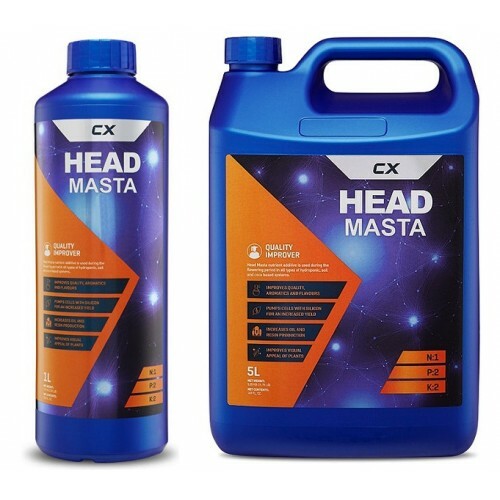 Canadian Xpress Head Masta is a top of the line enhancer for flowers and plants. It adds a nice fragrance and flavour to greenery and flowers. This product was designed to enhance the quality of crops to make them produce a better quality outcome than others. It can be accompanied by other nutrients to help improve the quality of the products. This product contains ingredients that work to improve the yield of the plant’s production. Therefore, yielding a greater quality of crop. Today’s technological approach to plant production requires sophisticated options. One of the most exciting things about Canadian Xpress Head Masta is the quality of the ingredients used to formulate the substance. These are pure quality ingredients that when combined, they work together to enhance the process of flower and plant production. Growers experience larger yields of indigenous quality of their crops. This product makes it possible for growers to trust the growth process without the extra work or effort it requires to produce a quality crop. It combines the proper elements to produce a nourishing environment to stimulate the hormonal budding trigger to enhance the formation and production of buds and flowers. In addition, this product delivers the essential nutrients to make certain that plants receive the proper amount of minerals and vitamins for production and growth. The silicon additive helps to develop intense cell walls to aide in weight development in the ultimate product and motivates the flower to crave potassium. Finally, Canadian Xpress Head Masta aides plants in the proper regulation of water intake. Plants or flowers that consume massive amounts of nutrients could possibly ingest too much or not enough water. This can cause the flowering process to produce less and be of less quality. Canadian Xpress Head Masta ensures that the plants or flowers takes in ample amounts of water to allow them to experience optimized flower production. It is recommended that Canadian Xpress Head Masta should be used from week two of flowering up until the flush for best results use with Canadian Xpress Mighty Bloom Enhancer. Be sure to shake container well before each use. This ensures that the ingredients are mixed well prior to distribution and permits a quality delivery with each use. Mix your normal vitamin and mineral solution as always and combine Canadian Xpress Head Masta at a 1ml per 1Litre proportion. pH balance can be adjusted as needed. It is important to remember that as with all minerals and vitamins, enhancers and additives should not be combined or mixed in their concentrated or original form. Therefore, they should never be mixed directly from the container. You should add each vitamin, mineral, enhancer or booster to the water and follow-up by adamantly stirring the solution prior to the addition of the next additive. When utilizing any substance with living organisms, you should always use purified water. Here are a few recommended steps for growers to consider. There are measuring instruments available to verify the strength of nutrients. Also note that the temperature can alter the conductivity factor reading. Cold nutrient mixtures will deliver a lower reading than warm solution mixtures. There are a few boosters that should go directly into the growth media. However, most should be added to the solution of nutrients. Primarily, mix-in boosters and follow-up with additives. Next, finish the solution by adding the nutrients until the proper conductivity factor reading is obtained. Plants will absorb vitamins and nutrients based on their pH. It is recommended that you obtain a pH balance of 6 but a minimum of 5.5 and a maximum of 6.5 will work also. Adjust the pH if it is below or above this recommended range. As plants consume the nutrients, pH in the feed begins to float. Check the levels periodically and make any necessary adjustments to keep it within the recommended range. Observe your plants to ensure that they aren’t being fed too little or too much. If it appears either is the case, alter the strength of the solution or feed being used. Canadian Xpress Head Masta transforms your plants and flowers into high quality crops. Quality, aroma, and production is improved, and there is an upsurge in resin and oil.